Trilobites are some of the most beautiful and interesting fossils. They are extinct arthropods and belong to the same phylum that includes scorpions, spiders, "horseshoe crabs," barnacles, and crabs, etc. Trilobites lived during the Paleozoic and especially flourished during the Devonian. Trilobites were the first animals in the fossil record with preserved ocular lenses (arranged in vertical-arranged bundles of calcite rods, commonly referred to as compound eyes), which, by the way, provided sharp vision for detecting predators. One genus has many specimens with these well-preserved eyes. It is Phacops, a genus that ranges from Silurian to Devonian, in North American and Europe. The photograph shown below is Phacops rana (Green, 1832) from the Silica Formation in Ohio. This species, which is of Middle Devonian age (about 390 million years), is the state fossil of Pennsylvania. The species is found also in northeastern USA, Ontario, and Morocco, Africa. This last occurrence can be explained because during North America was once attached to the African tectonic plate. Dorsal (top) view of a specimen of Phacops rana. There are two areas of compound lenses (eyes), on both sides of the head. The large, swollen and bumpy area in between the eyes is the stomach region. 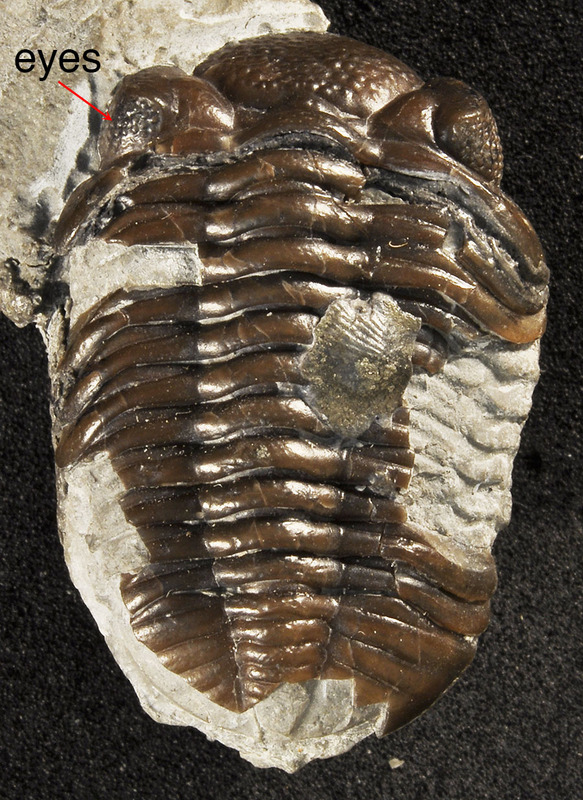 The entire trilobite body is 30 mm in length and 20 mm in width; each eye area is about 3 mm in width. There is attached inarticulate-brachiopod shell (6 mm width) on the central right side of the body. The compound eye of P. rana differs from most other trilobites by having relatively fewer and more widely lenses, as well as rounded lenses, rather than being largely flat. The lenses of P. rana were elevated, thereby allowing for an almost 360° field of view. This type of eye is called the schizochroal eye. Oblique, close-up view of the eyes on the right side of the specimen shown above. The width of the eye (the area with the aligned bumps) is 3 mm.